Useful For Testing Of Plates, Pipelines, Pressure Vessels, Storage Tanks, Rolled Sheets, Dished Ends, Reactors, Heat Exchangers, Distillation Columns, Dryers, Condensers, Boiler Coils & Tubes, Gas Cylinders, Compressors, Ship Hulls, Kilns, Plastic Parts, Pumps & Valves PVC & HDPE Pipes And Containtes, Plastic Water Storage Tanks, Etc. 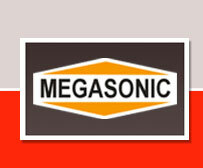 "MEGASONIC" is a leading manufacturer of Ultrasonic Instruments in INDIA since 22 years. The Company is promoted in 1987 by Technocrat whose experience is more than twenty five years in the field of Ultrasonic Technology. Our motivated team is composed of well qualified engineers and skilled technicians who are regularly trained to remain in the forefront of the changing technology. To ensure the products are of optimum quality we have various quality control mechanisms at all levels. The aim of our in house R & D is to provide world class products at reasonable cost in India. Manufacturers Of Thickness Gauge, Ultrasonic Thickness Gauge, Ultrasonic Probe, D Meter, Non Destructive Testing Instruments (NDT Instruments). Regd. Office & Works : 113, Ashok Industrial Estate, Near Shangrila Co.
L. B. S. Marg, Bhandup (W), Mumbai - 400 078 Maharashtra, India.